So…..we departed New Orleans after a 1-day delay due to heavy rains and generally crappy weather. The Big Easy is a city that we will definitely visit again – there is so much to see and do, and we barely scratched the surface during our 6-day stay. One thing we will NOT miss about Louisiana are the roads – and especially in and around New Orleans. Really bad. We continued our easterly travels, leaving Louisiana, then passing through Alabama and Mississippi on our way to Pensacola, Florida. The roads smoothed out as we changed states, making the drive much easier. Alabama and Mississippi roads are EXCELLENT! A pleasant thing we encountered were the rest areas we encountered, all of them located at the state lines. They were really huge welcome centers; very clean, great landscaping and many tree-covered picnic areas, as well as food services. Western and central states can take a lesson here…no comparison and like none we have ever encountered – at least so far. 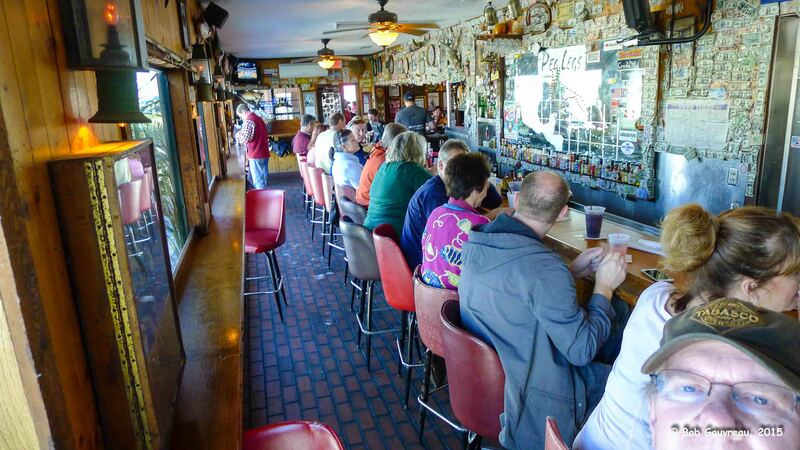 Our first stop in Pensacola – Peg Leg Pete’s Bar – great vodka oyster shots! 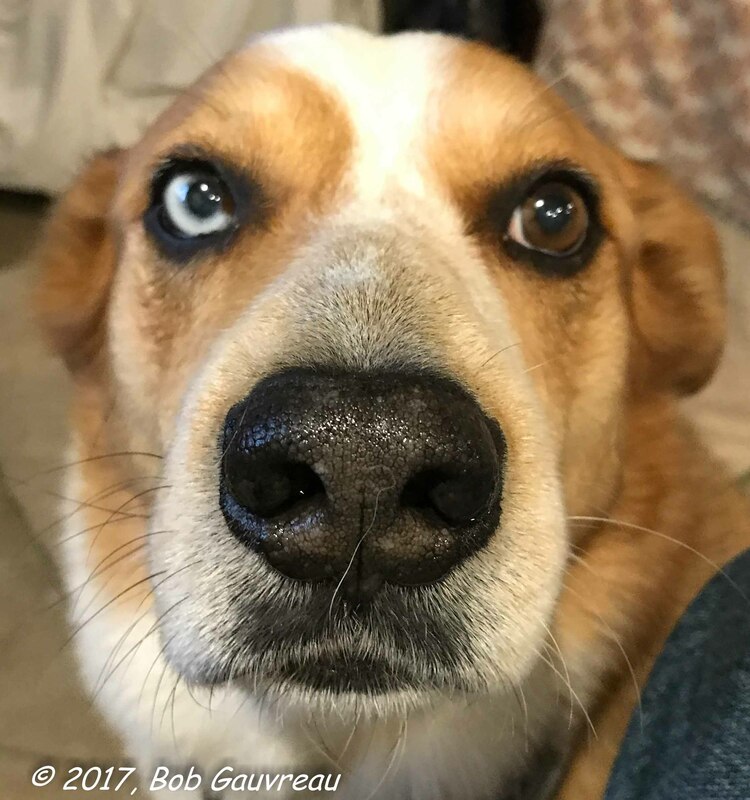 ‘Ball? 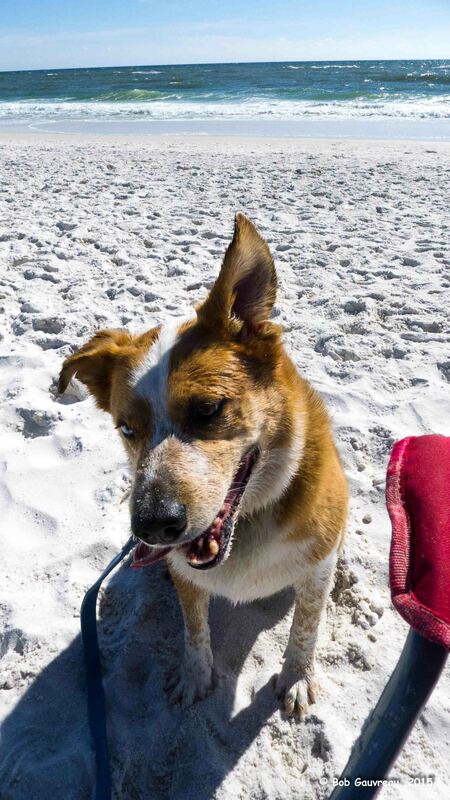 Did I hear someone say Ball?’ Charlie on the beach, Pensacola, FL. After passing through 4 states in 4 hours, we stopped at a pleasant campground about 15 miles west of Pensacola. Very friendly, big spaces, a huge pond (turtles, but no ‘gators according to the friendly owner) and lots of room for Charlie to run and Marshall Dylan to roam (on his leash.) Pensacola, as you probably know, is a Navy town, home of the Blue Angels. Lots of water with long connecting causeways. It’s really a party place, with lots of restaurants, bars and incredible white sand beaches. We drove out to Ft. Pickens where there is a great NPS campground, several WW2 gun emplacements and historic buildings. If we come here again, we will definitely try to stay there. One downside of the beaches here is that they are generally not very ‘dog-friendly.’ Most areas don’t allow dogs at all, and those areas that do are small (like maybe 100 yards of so long) and we noticed that most people kept their critters leashed. Charlie was the exception. As mentioned previously, he has become a real ‘surfer dog,’ and has started spending a lot of time in the water. 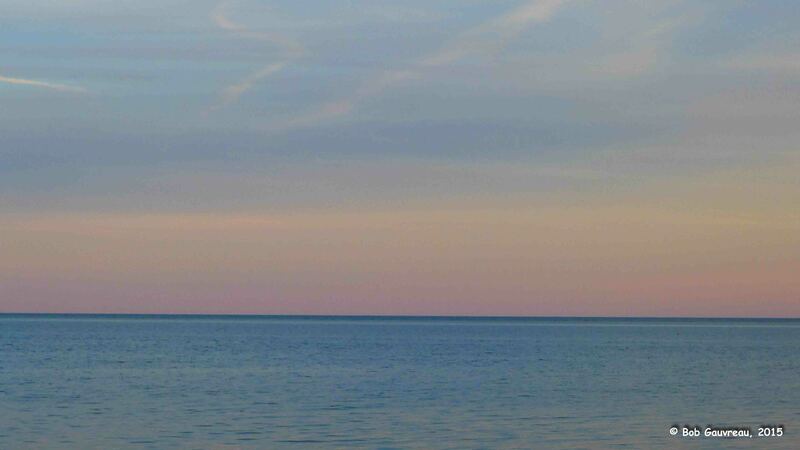 View from our site, Ho-Hum RV Park, Carrabelle, FL. 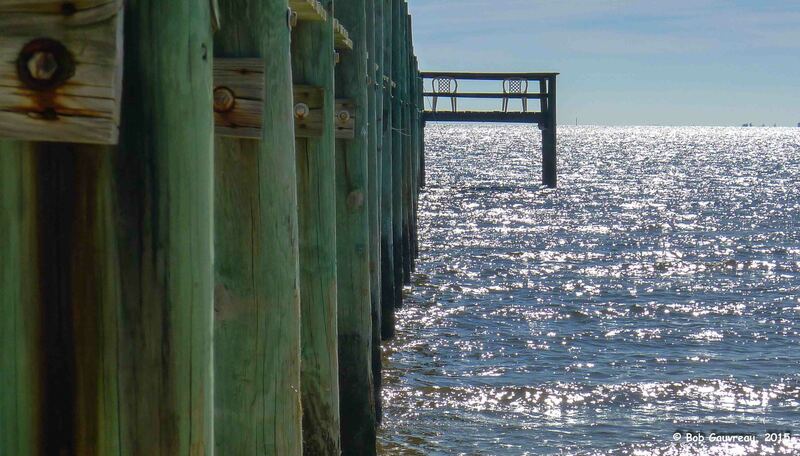 Fishing pier in near our site at the Ho-Hum RV Park, Carrabelle, FL. Palmettos and pine trees, off the beach near our site at the Ho-Hum RV Park, Carrabelle, FL. 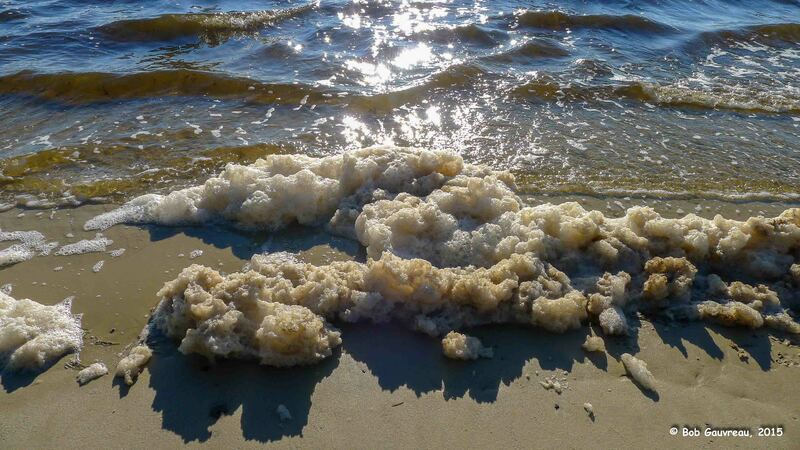 Foam on the beach, near our site at the Ho-Hum RV Park, Carrabelle, FL. 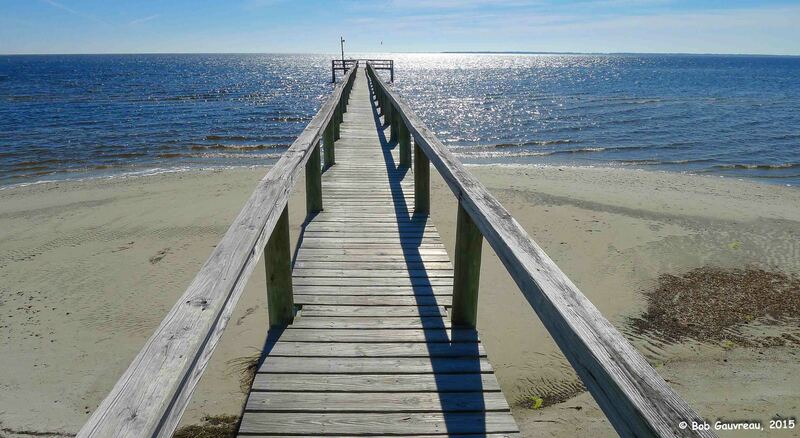 Our next stop was the Ho-Hum RV Park in Carrabelle, Florida. Of all the places we have stayed up to now, this was – by far – the very best. Funky, yes, with fairly big spots. Everyone there was super laid back and overtly friendly. What a great place! We had this way-cool site right on the on the beach – it was literally 10 feet to the Gulf of Mexico. We spent about a week here and enjoyed every minute of it. 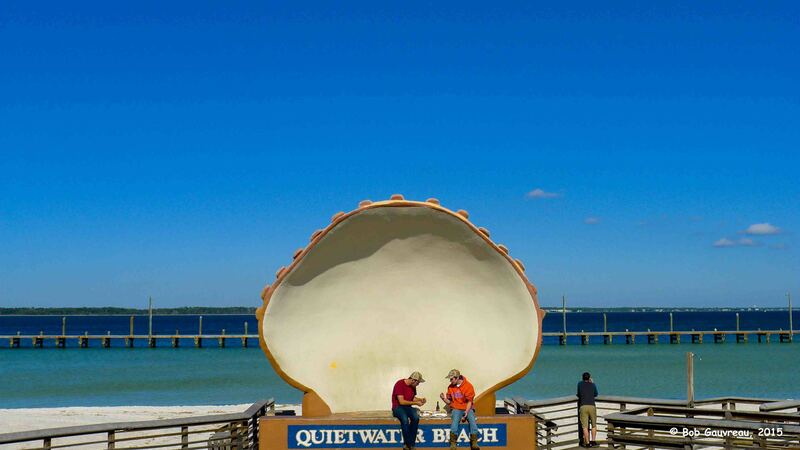 Ho-Hum lives up to its name: it really has a feeling of ‘Old Florida;’ this part of the state, in the center of the Florida Panhandle, is known as the ‘Forgotten Coast.’ In most places it is uncrowded, with little encroachment of condo’s and hotels. Pretty undeveloped overall and really beautiful. 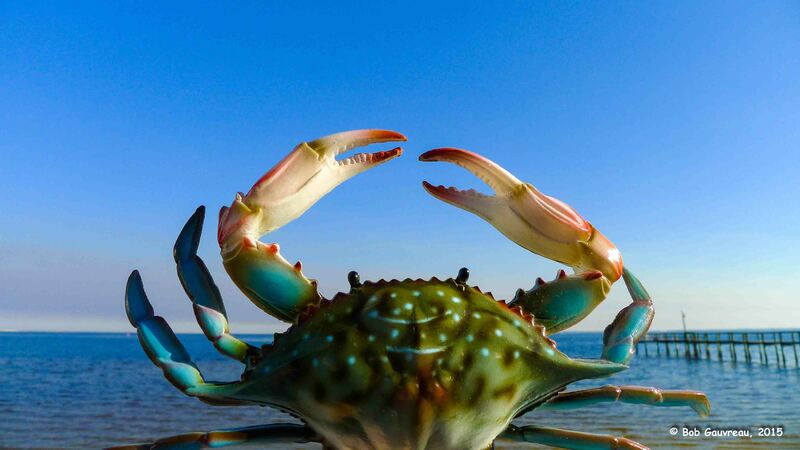 Giant Stone Crab, Carrabelle, FL. 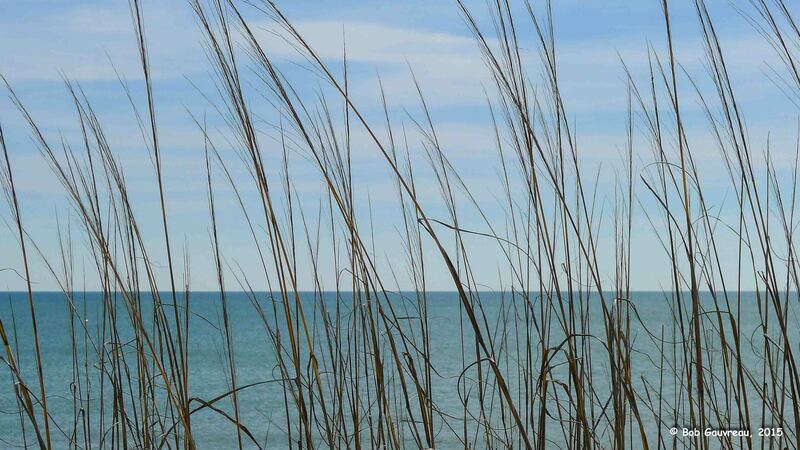 Grasses and ocean, near Mexico Beach, FL. 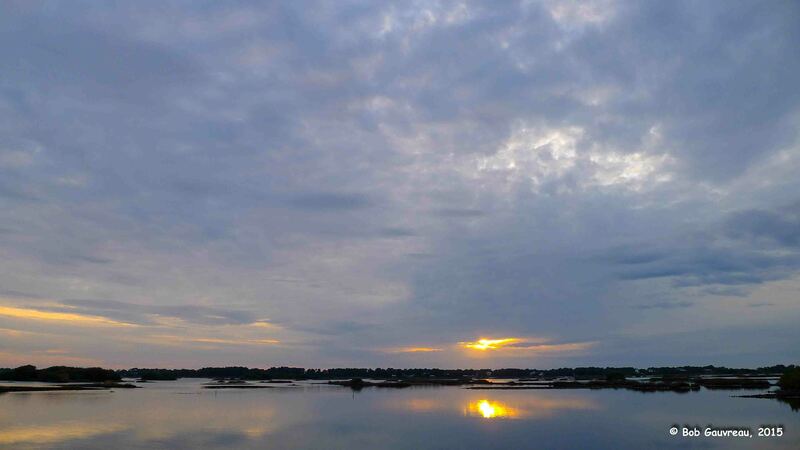 Sunrise, the morning we left the Ho-Hum RV Park in Carrabelle, FL. Sunrise, from our spot at thee Ho-Hum RV Park in Carrabelle, Florida. And it’s like this almost every morning. 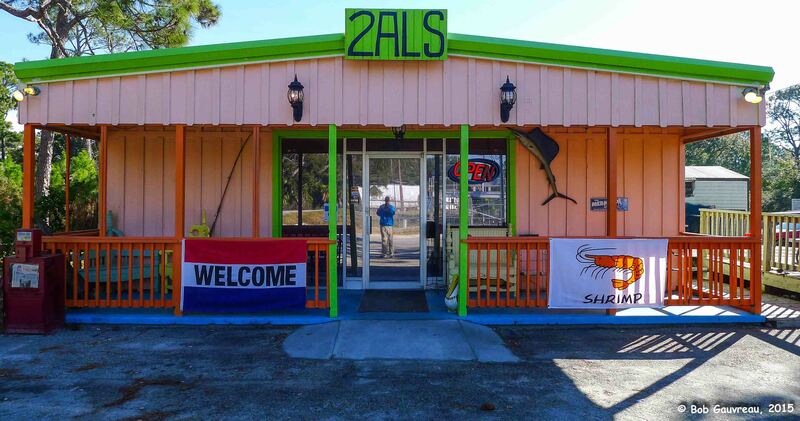 2 Al’s diner, near Carrabelle, FL. Florida funky with great, and cheap, food. Very cool place. 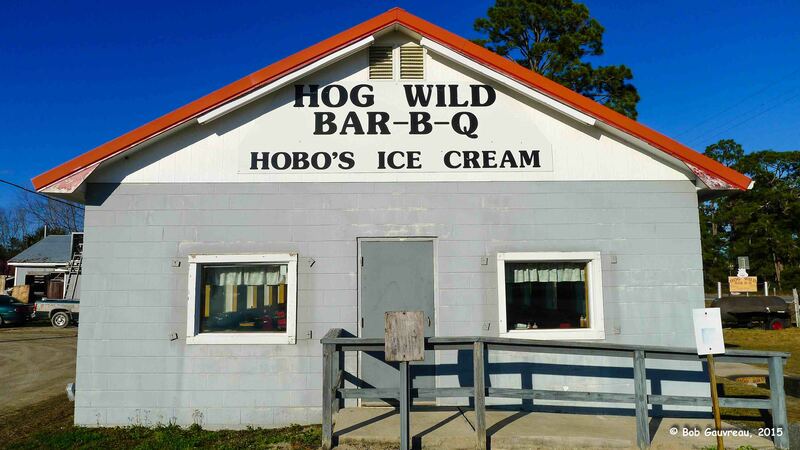 Hog Wild Ribs, near our place at the Ho-Hum RV Park, Carrabelle, FL. Great place! Ho-Hum is also unique in that it is on the ‘beach side’ of Highway 98; the other RV parks we encountered, all the way up to Mexico Beach (about 60 miles away) are on the ‘other side’ of the road; most of them were full and pretty cramped. Another nice thing about this place was the mile or so of totally empty, unpopulated, beach that was immediately adjacent to the campground – lots of room for dogs to swim and chase tennis balls. Wahoo! I managed to get in a round of golf at a very nice near-by course (with a special ‘tourist rate.’). It was without a doubt one of the most difficult I have ever played. Every hole – EVERY SINGLE HOLE – had at least one water hazard that crossed the fairway in the form of a swamp. The guy in the pro shop told me they have 5-6 resident ‘gators, but I did not encounter any of them. The course was in excellent condition and the greens were like pool tables. 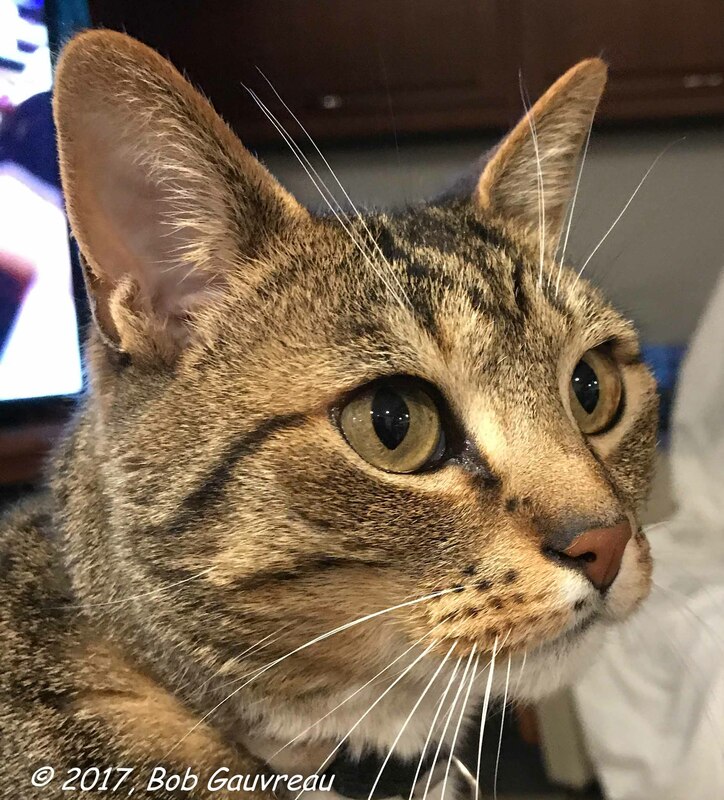 From Ho Hum, Dee Dee and I drove back to the west and visited Apalachicola, Port St. Joseph (which at one time was destined to be the State capitol – until the entire town was destroyed by a storm and the capitol was then located to Tallahassee, not too far away) and finally Mexico Beach. 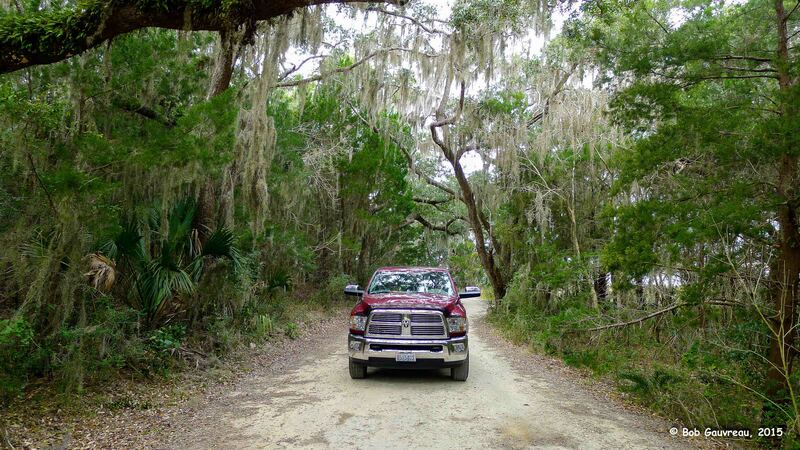 On another day trip we drove across a long causeway to St. George Island, a long barrier island that is home to a very nice state park with beautiful campgrounds. However, even though you can have leashed dogs in the campground, all the beaches are totally closed to dogs. Charlie was pretty bummed. But, this is also a place we would consider staying sometime in the future…maybe. The day before we left delightful Ho-Hum, we made a reservation for next year – we plan to spend a month here next time. If all goes as we expect, we will be travelling with our good friends Gary and Debbie; we both made side-by-side reservations for spots right on the beach. 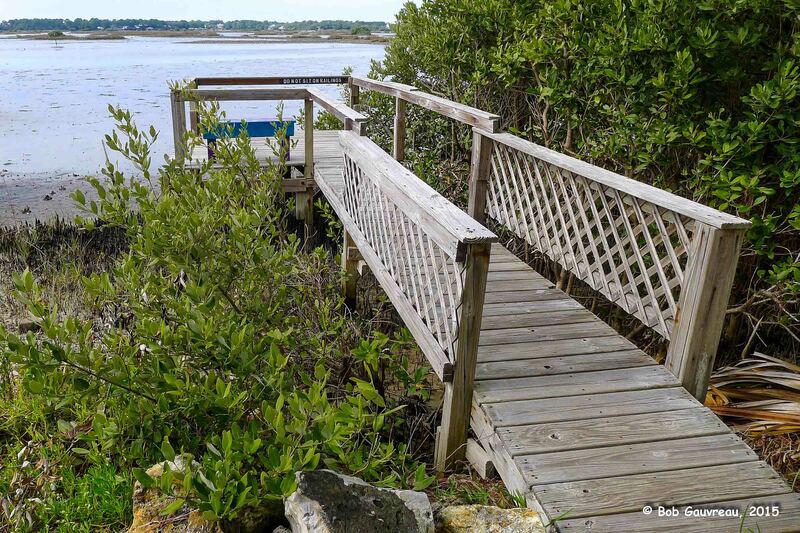 The dock in front of our site, at the Sunset Isle RV Park, Cedar Key, FL. Porch at the Sunset Isle RV Park, Cedar Key, FL. 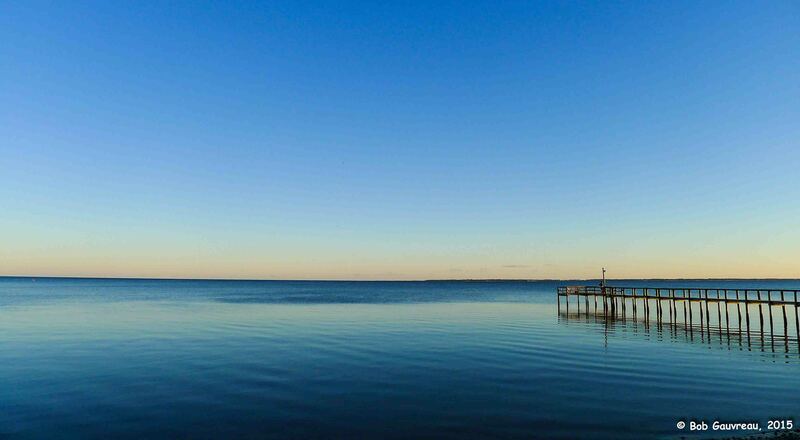 Next, we were off to Cedar Key. Now, keep in mind that we made all of our reservations last August, using information we garnered from the Inner-Net – which we all know is a bastion of truth – and never lies…or at least hardly ever. Maybe the truth was stretched a bit for this place. 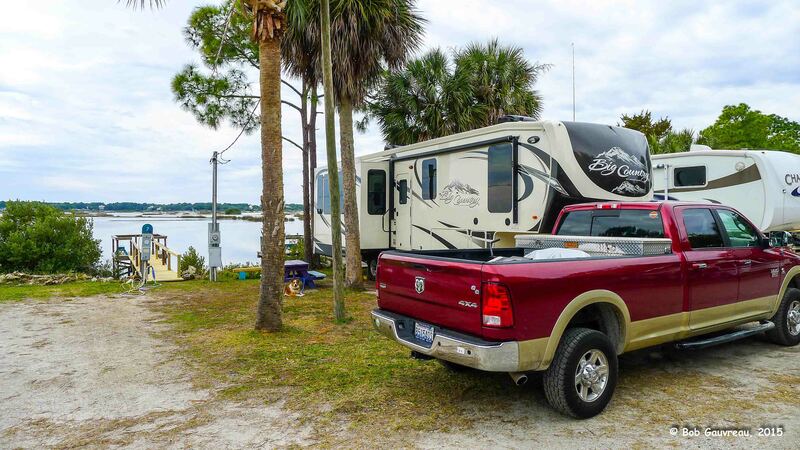 As soon as we drove into our destination – Sunset Isle RV Park – we turned to each other and said, simultaneously, “I think we screwed up.” Even though we had a site right on the water, with a small dock, the entire campground was the most cramped we had EVER experienced almost anywhere. Postage stamp sites. It took us a good 20 minutes just to squeeze into our site. Also, the volunteer campground hosts kept a fire going day and night, that most of the time was like a smudge pot; the smoke was carried right into our site by the prevailing wind. Worse, there was no place to run Charlie. Not good. We got so fed up with this place that we departed a day early. They had a policy of ‘no refunds,’ so we lost that day, and also got stuck with a good portion of the space rent (and it ain’t cheap here) for another 5 days we had reserved for our return trip back up the state from the Everglades and Key West. After some discussion with the site manager, that revolved around their misleading web site on the Inner-Net, we managed to get some – but not all – of our money back. OK…lesson learned. 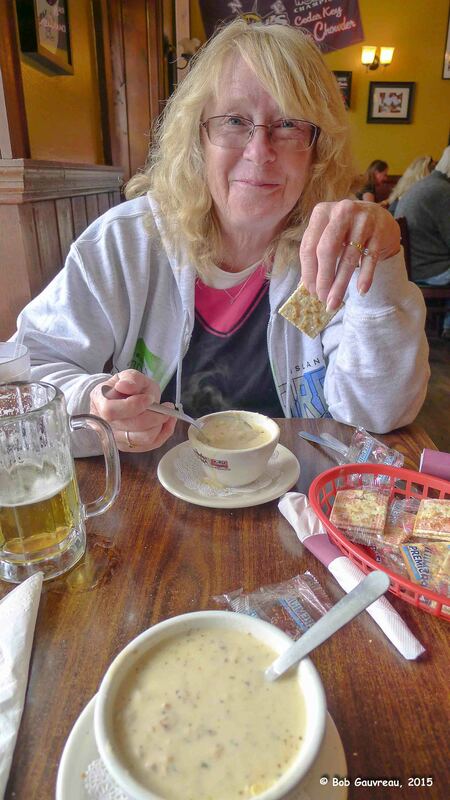 Clam Chowder at Tony’s; some of the best we have ever tasted! 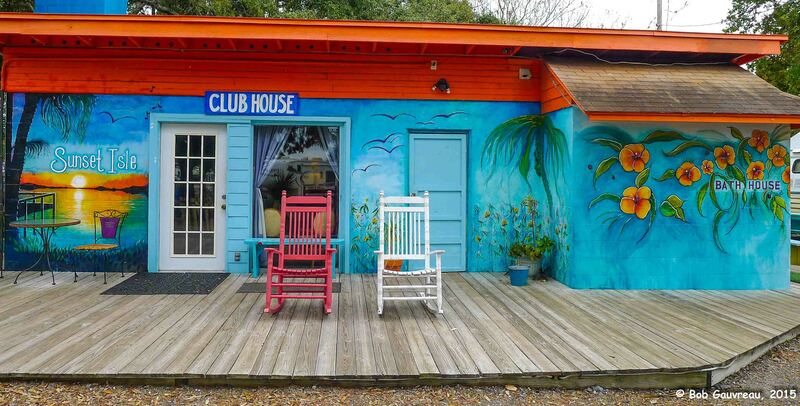 The general area of Cedar Key was ‘Florida Funky,’ but unfortunately its popularity was also its downfall. To us it seemed way over-built. Too many people, too much traffic. On the upside, there were lots and lots of restaurants. Generally pricey, but good. As an interesting (at least to us) side note: when we were visiting St. George Island we met some people on the beach who were also headed for Cedar Key, where they were renting a condo. We had dinner with them one evening at this place called Peter’s. Excellent food at a very reasonable price. We also had a chance to visit them at their place – 3rd floor water-front condo with an amazing view. 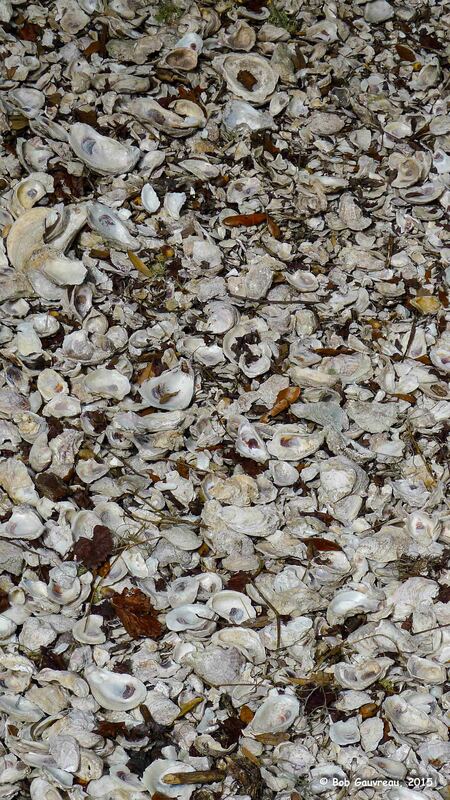 Ancient oyster shell remnants, ‘Shell Mound,’ near Cedar Key, FL. 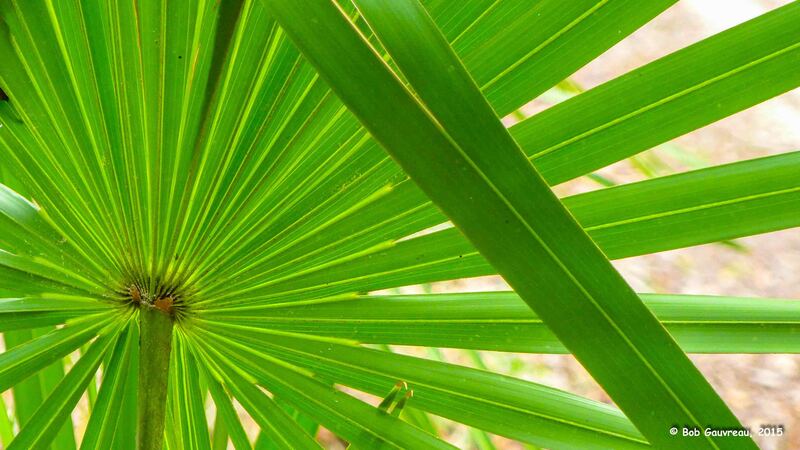 Palmettos, near ‘Shell Mound,’ Cedar Key, FL. 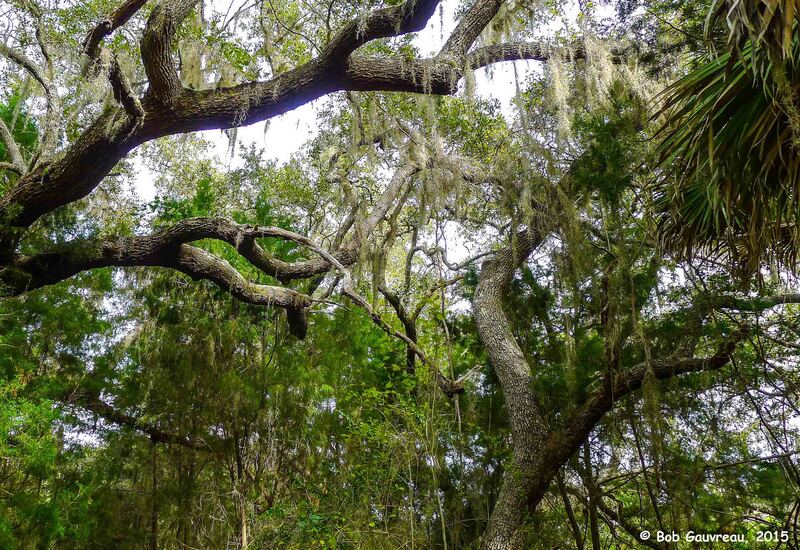 Live Oaks, near ‘Shell Mound,’ Cedar Key, FL. 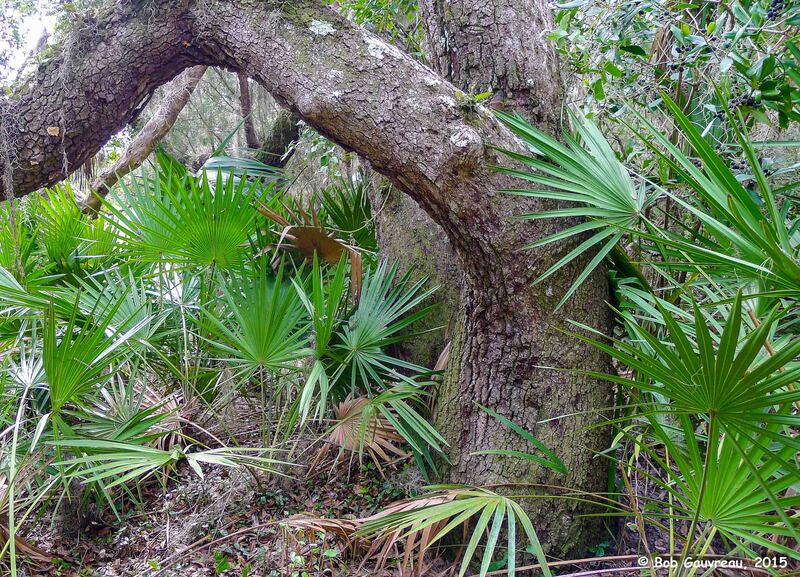 Live Oak and palmettos, near the ‘Shell Mound’ area, Cedar Key, FL. 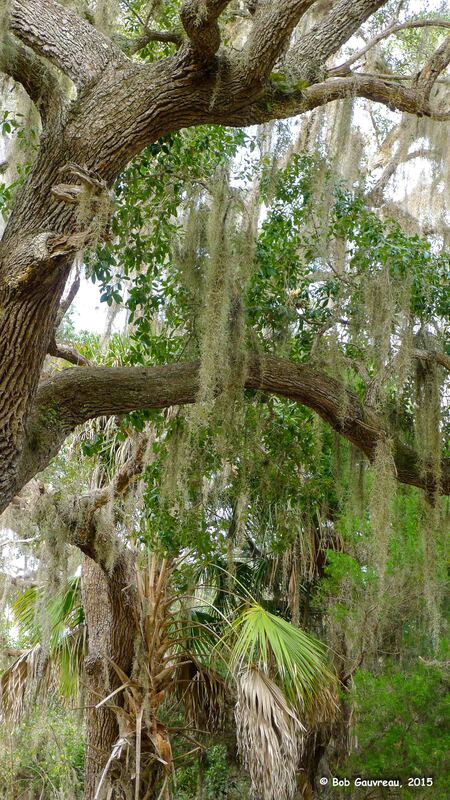 Live Oak and moss, near the ‘Shell Mound’ area, Cedar Key, FL. We drove around the area for a couple of days and visited this site called ‘Shell Mound.’ The location was significant; in ancient times, local indigenous people discarded oysters shells (oysters being one of their primary food sources), creating a huge mound of shells that covered several acres and reached a height over 100 feet. There was a path to the top and although now covered by huge live oaks and palmettos; you still get a sense of the huge scale of the place. Absolutely amazing. 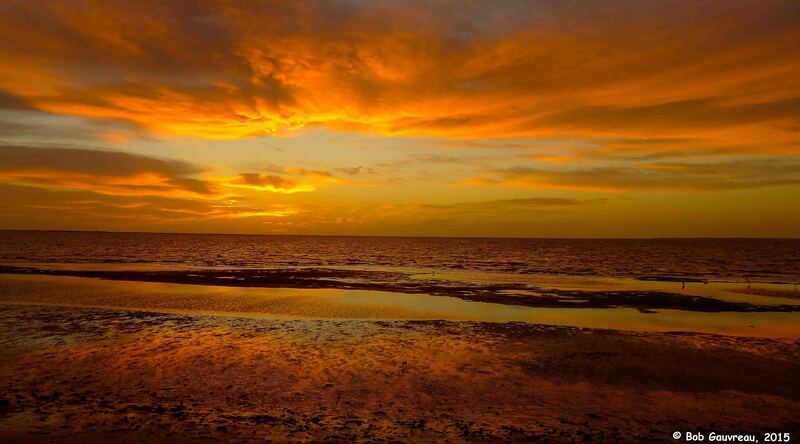 They also constructed oyster shell causeways through the low-lying beaches. We also got badly needed haircuts while here. Badly needed. Did I say BADLY needed? 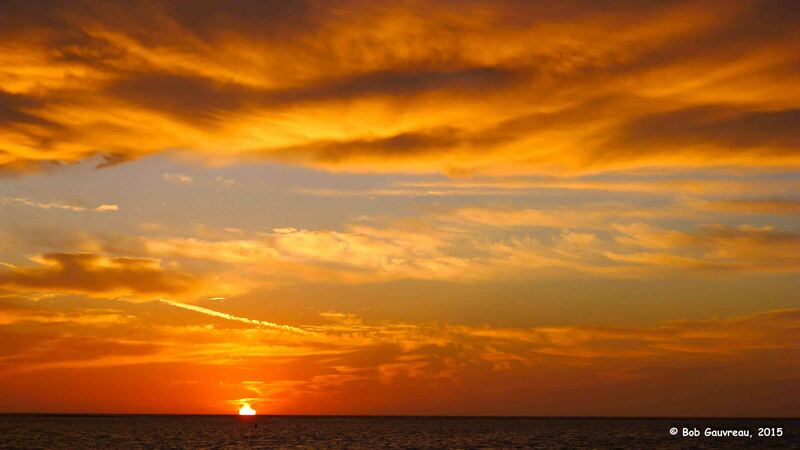 Sunset from our site at the Sunset Isle RV Park, Cedar Key, FL. During our exploration of Cedar Key, we did find another RV park about 5 miles outside of town. Spacious and quiet. If we ever return to the area, would definitely stay here. And, the cost was about the same as Sunset Isle. Unfortunately, our friend Diane contracted a bad case of the flu, so our planned visit together got short-circuited. We did talk a bit with Jim, though, and have plans to visit them on our return trip from Chokoloskee Island (near Everglade City and right on the edge of Everglades National Park), where we are now.